"I was immediately charmed... Seligman's intentions are admirable and exciting. He is consumed by his mission, which is to take psychology on from its traditional role in alleviating misery, and broaden it into positive psychology -- the entirely different art of teaching us how to be wiser, stronger, more generous to others, more self-disciplined, and more capable of dealing with difficulty and rejection... The book is full of nuggets about why positive approaches work." I do not recommend this book if you are interested in understanding positive psychology research or how you may apply its principles to your life. There's pages and pages of HOW Seligman teaches his findings (worksheets! train-the-trainer! role playing!) and WHO studies his work (extremely impressive, extraordinary, important people who pay him a lot, a lot of money!) -- but very little explanation of the findings themselves. The actual psychology content of this book could be boiled down to less than 50 pages. The book is also interspersed by out-of-place asides on odd topics like "I'm not saying that veterans are necessarily FAKING having PTSD, but here's a bunch of facts that sure seem suspicious, huh?" and "People say that I helped the CIA to design torture programs but that's actually not a very nuanced understanding of the substantial assistance I granted them" and "One time this one lady in Australia wrote an op-ed criticizing my work and it really irritated me." This book is more "that one older relative at your Thanksgiving dinner who rambles on and on" than it is Malcolm Gladwell. Disappointing, because a good edit could have excavated an interesting book out of this fossil matrix. 2.0 颗星，最多 5 颗星Oversells a great Idea. Lacks coherent follow-through. The very first line of the preface of the book states: "This book will help you flourish." That comment is quite an oversell and is disingenuous at best. I've genuinely been trying to give this book a fair chance, but so far fail to be sufficiently impressed. The content of the book argues for why "well being" is a better descriptor and goal than happiness in various settings and context, yet the author never seems to get around to the nuts and bolts of how that is accomplished. Rather, the book serves as more of a biographical memoir highlighting the events that brought forth the idea of "flourishing" and "well being," particularly in academic circles. With that, it also acts as a bit of a marketing-type grab for folks to toggle over to the UPenn website with the intent of having more participants fill out questionnaires that add to the database for research, all without any real benefit/feedback for the persons going through the effort of completing the material. Seligman's general concept is well received, and he goes to great lengths to sell the idea, but it's an idea that is not well expounded by his writing here. I'd recommend folks wait until something more substantive is released with coherent details, and which holds merit beyond being a book length version of something that could have been covered via a quick magazine article. I did not even know there was a field of study called "positive psychology" until I saw Dr. Seligman's Ted talk. What he said, how he said it, spoke to me. I decided to buy his happiness book, and on the way to do that discovered he had a newer book... this one. I bought it and could not put it down. The man has a rich vocabulary, and I'm sure that turns some people off... you will see words that rarely appear outside of a college entrance exam and none of that diminishes the value and impact of the insights he shares and the science he explains. I've seen the reviews, several, suggesting the book should be better organized. I completely disagree with those reviews. Having read through the book in just a few days I can say it was structured very cohesively for me; nothing was introduced before a foundation was in place to support a strong understanding. Why only 4 stars? Maybe I don't like having to dig back into the memories of long forgotten vocabulary tests to parse out the few sentences that challenged my powers of context deduction. No fluff, all deep stuff. 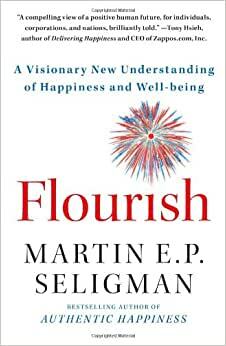 I have used Flourish as the textbook in an undergraduate course called Positive Psychology. This course is in the curriculum of Prescott College's Adult Degree Program. Dr. Seligman has packed into this book the findings of a huge amount of empirical research on the effectiveness of a positive approach to many many kinds of human emotional challenges, from simple down-in-the-dumps feelings to major psychological dysfunctions. Since all his assertions are research-based, no "quick fixes" can be found, no "Polyanna juice" prescribed. I and virtually all of my students approached this book with caution, braced against one more shallow "feel-good" approach to greater and more regular satisfaction and happiness with everyday life. We were delighted to find our concerns unwarranted. Seligman describes dozens of research projects and presents the findings of those research studies. Those findings verify the efficacy of simple approaches to emotional difficulties, and they point to how people can reduce the incidence of those "bummer" times in their own lives. None of my students have ever suggested his ideas could be rolled into a single "quick fix." By the end of the course virtually all of them found themselves applying this book's ideas and...yes...flourishing.